Happy Monday y’all! We are back from a short trip to the beach and ready for the week ahead, albeit a little sunburned and with a whole lotta sand still left to clean out of the car. I hope you enjoyed a wonderful weekend and a festive 4th of July. The holiday may be over, but I wanted to share some tidbits of our party with you today. 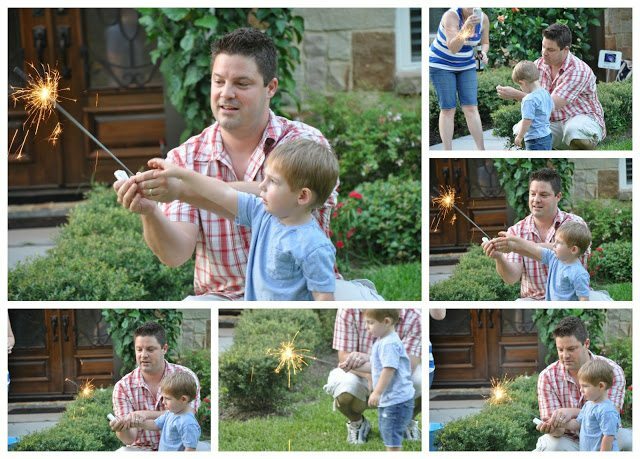 We had a handful of friends and their kiddos over, enjoyed a relaxed afternoon complete with food, drinks, blow up swimming pools, and sparklers galore. 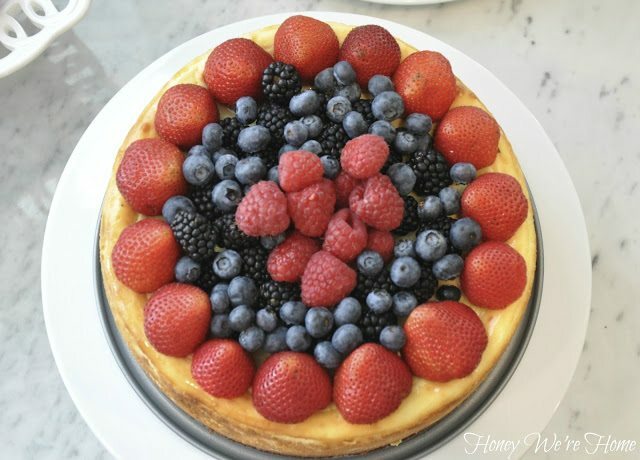 Of course, there had to be some red, white and blue dessert- so I added colorful berries to this cheesecake I made. I always use Ina Garten’s recipe and it turns out delicous every time. We only had one small piece left over after the party. Box-mix cupcakes were topped with toppers I made using picks and decorative scrapbook paper. 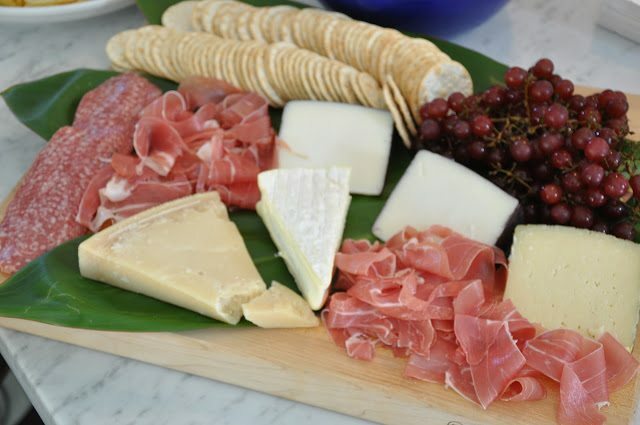 I’m a big fan of a meat and cheese plate at parties. This time, I piled everything on top of a giant wooden cutting board and picked up a couple big green leaves from the grocery store for a pretty display. 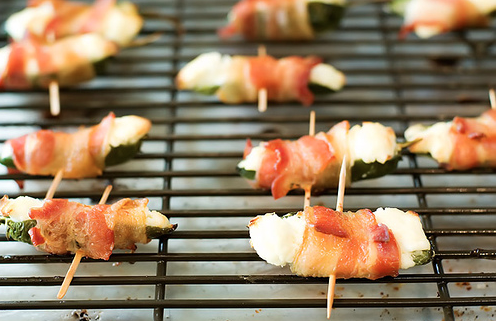 We also had bacon-wrapped jalapeños (that I forgot to photograph, so I borrowed this pic from Pioneer Woman) since I used her recipe anyway. We grilled up hamburgers and hotdogs and had various chips and dips too. 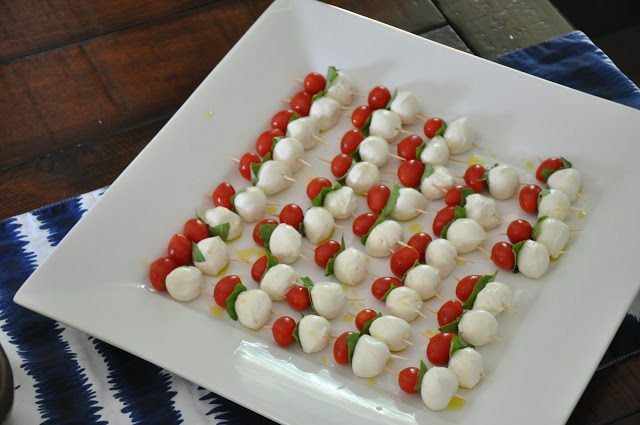 Chocolate-covered strawberries and caprese skewers also disappeared in no time. I was happy that the blue and white runner I already had from Z Gallerie was the perfect 4th of July colors to pair with some red Gerber daisies. Those gold vases were purchased at Home Goods for about $5 each. And you might notice I usually stick to white ceramic serving dishes. I think they look classic and always go with anything. I got most of mine at Home Goods. 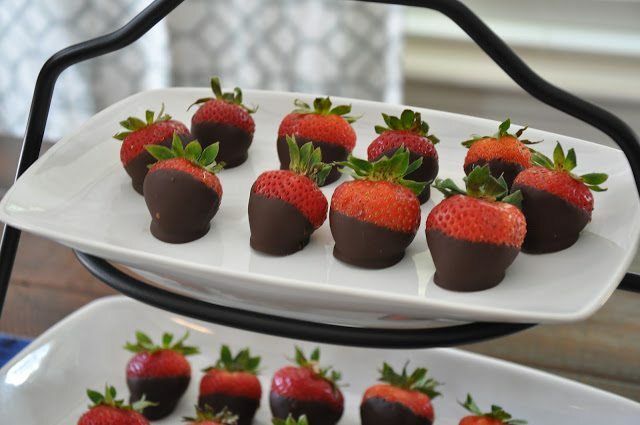 For the chocolate-dipped strawberries, I melted semisweet and bittersweet chips in a double boiler, and after dipping the strawberries, let them chill in the fridge on wax paper. 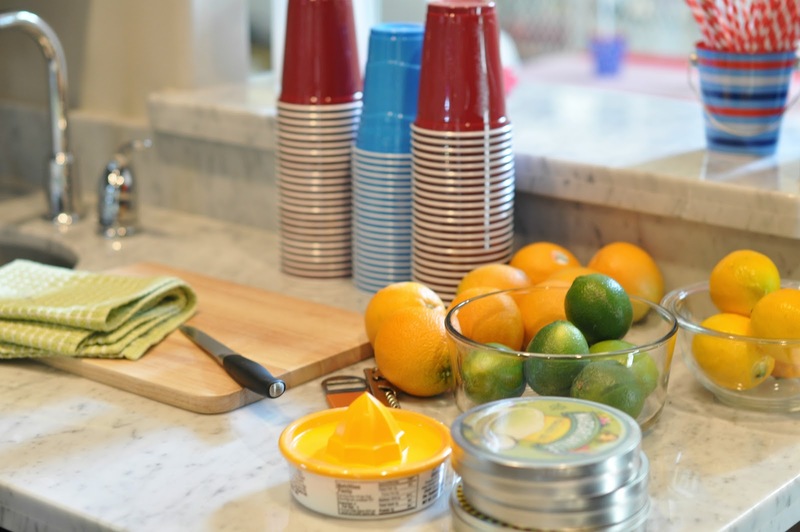 We stocked the bar with frozen margaritas and beer. 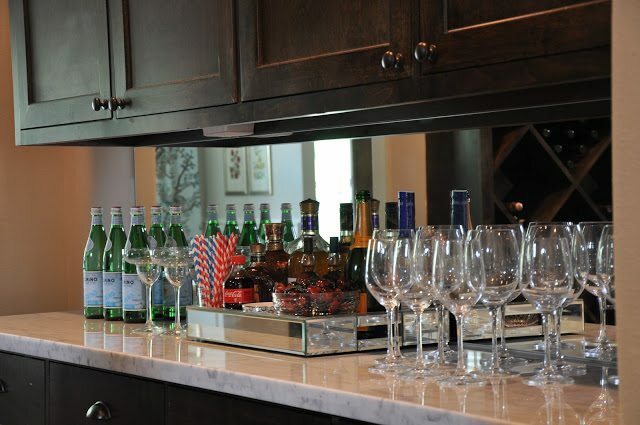 We don’t use our butler’s pantry that often, but it sure comes in handy when having a party. 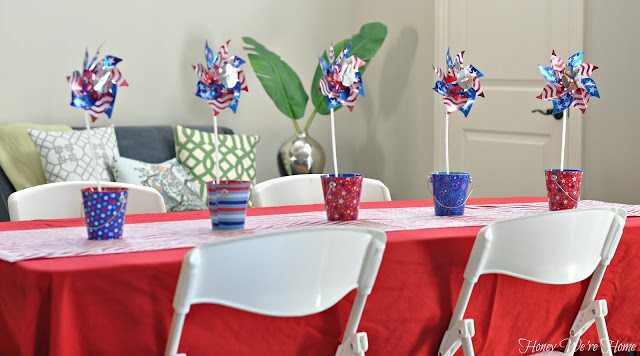 I didn’t go over-the-top with the decor, but a few artfully placed American flags were placed about the house and in the backyard. And how cute is this printable I found at The Crafting Chicks. 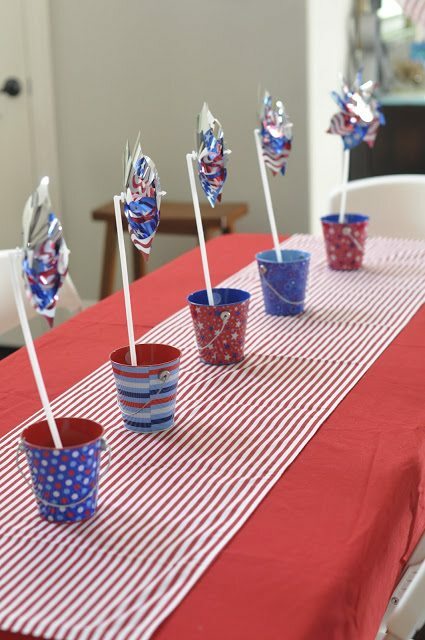 The mini windmills are standing up in sand contained in those dollar store pails. Our red tablecloth got dressed up with a red and white runner I made with a piece of fabric. Outside the kids played and splashed around in the water. 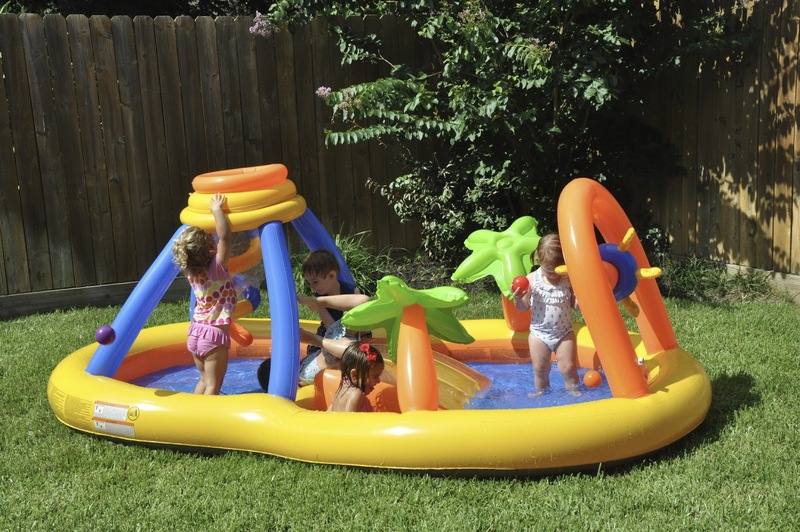 My parents bought up this blow up pool and the kids (ages 1-3) loved it. And of course, the party ended with pop rocks and sparklers, courtesy of my little brother who has a local fireworks stand. And congratulations to him, they had their best year ever in sales this year! Next Post Getting in FRONT of the Camera! That looks like a beautiful way to celebrate! This looks amazing. You look like a fabulous hostess. Great party!! All your little touches are perfect! 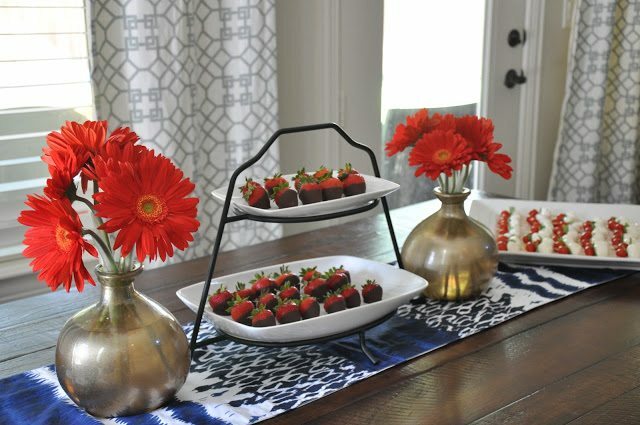 Love the red daisies against our navy runner…and the bar looked so pretty! your cheesecake is out of control gorgeous, too! how about pics of you at the party!?? Everything looks so good! And I love those sweet pictures of Jimmy and James! What a beautiful party! Hope you had a wonderful weekend at the beach! Looks like such a fun party. Everything looks great. Your cheesecake is so pretty. Looks like a fabulous party! I always use Ina Garten recipes too (her Beatty's chocolate cake is delish). Great but simple decor! That looked like such a neat party! Everything looked beautiful! Looks like you guys had a great time! And all of your party food and decorations were beautiful! So festive!! Love all of the details including the cupcake toppers and table runner. Looks like a wonderful day. James is as adorable as ever! So fun, Megan. What a great collection of photos of James and Jimmy. 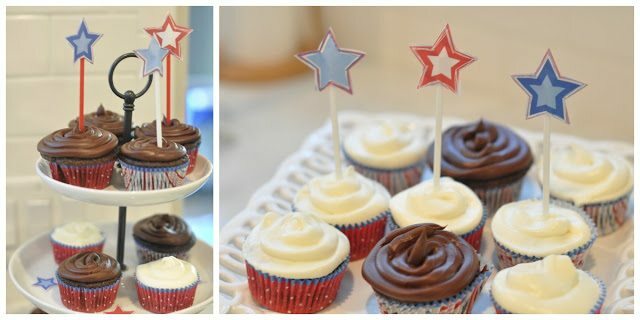 I love your little scrapbook cupcake toppers. I bought an Ina book . . now I just need to open it! What a fantastic party…very festive. The food looks amazing. And, I too have gone to all white dishes and serving pieces. That and clear glass make it so easy to decorate. the party, the food, that pool everything looks great megan!! 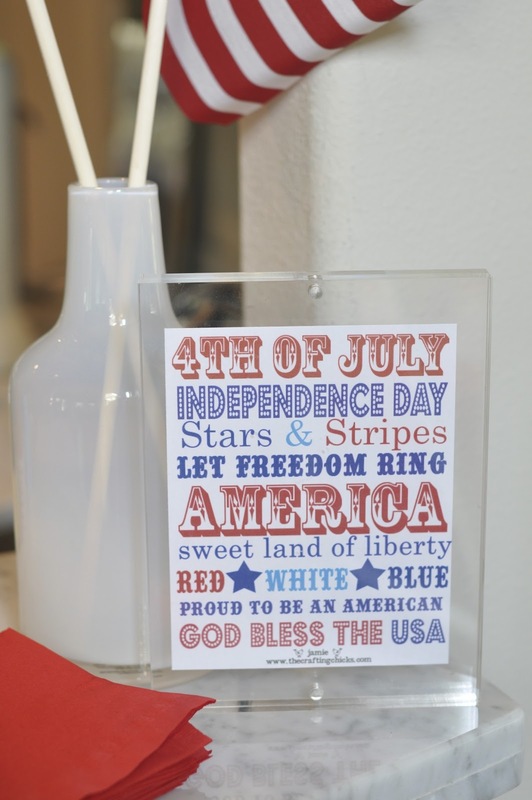 happy 4th to your family! where did your parents get the pool from. Fun party you had! Looks like a great party! That cheesecake looks amazing! All your dishes look amazing and great decorations too!